So let’s say you have a submarine, or a nuclear containment chamber which has walls made of thick metal. Now let’s say you want to transmit power or data through this wall. Obviously you’re not going to want to drill a hole since this wall is either keeping seawater out, or potential contamination in, but wireless signals aren’t going to travel well through dense metal. [Tristan Lawry’s] entry in the Lamelson-MIT Rensselaer Student Prize seeks to address this issue by using ultrasound waves to transmit data and power. 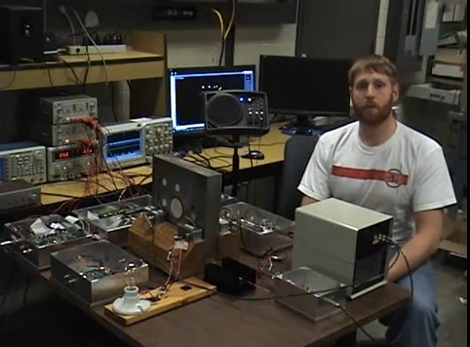 In the video after the break [Tristan] speaks briefly about his project, then demonstrates the transmission of power and digital audio simultaneously through a two-inch thick steel plate. This is accomplished with a set of piezo transducers attached to both the inside and outside of the plate. Communications originate by feeding electricity to one transducer, which sends ultrasonic vibrations through the material to be received by its counterpart on the other side. It’s easy for us to understand data transmission conducted in this manner, after all that’s how the knock block receives information. What we don’t understand is how it can “transfer large amounts of electrical power”. If you can explain it in layman’s terms please do so in the comments. 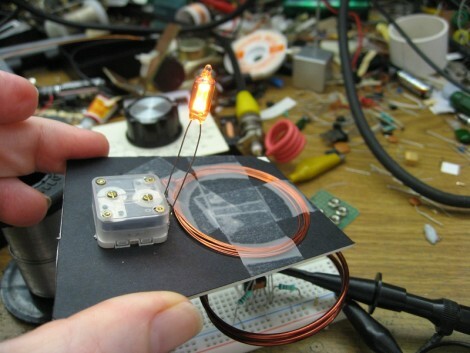 [Robotkid249] details how to build a wireless power transmission system. This is similar to the commercial applications we have seen in a TED talk as well is in a Sony prototype. Power is fed to a ring made of magnet wire. A smaller loop is attached to the system that you want to power and picked up from the base unit. In this case, he is powering some LEDs but the concept can be tailored for your purposes such as an inductive charging pad. We’d like to see a hack that incorporates the base into a mouse pad (or the desk itself) and the receiver into the body of a wireless mouse. We’ve seen a commercial solution along these lines but we want one that doesn’t require a physical connection for power transfer.